Snooker is a classy game of finesse and accuracy. The sport is extremely strategic and popular, so if you wanted to learn how to play, then you came to the right place. The object of the game is to see which player can score the most points in each frame. To score points you must use the pool stick to guide the cue ball into hitting a red ball into one of the 6 sockets. In order to pot the colored balls, you must first successfully pot a red ball. The cue ball is a white ball that is used to knock other balls into the pockets along the railing of the table. It is important to note that the cue ball cannot go into any of the pockets and must hit another ball on the table or else it will be deemed a scratch. The snooker table generally will feature a baulk line with 3 dots at the head of the table and a blue spot in the center, a black spot by the foot of the table, and a pink spot in between the blue and the black spot. These spots indicate where to put the different colored/valued balls. Also, in between the pink and the black ball lies the rack of red balls. To perform the initial break, you must line the cue ball behind the baulk line at the head of the table and aim around the colors to hit the red rack of balls. The goal of your break should be to strategically try and get advantageous ball placement. The player must hit a red ball first, and then hit a colored ball after. 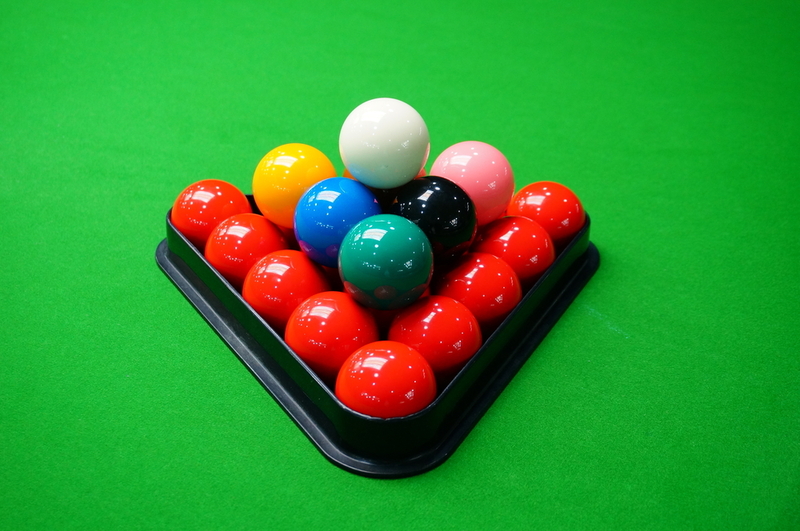 When they hit the colored ball before all the red balls are off the table, they cannot sink it, but are only allowed to use it for strategic advantages or perform billiard shots (when you hit a ball and it hits another ball into a pocket). Once all of the red balls are cleared off the table, players must sink the other colored balls in ascending order, according to their values. The order goes as follows: yellow (2 points), green (3 points), brown (4 points), blue (5 points), pink (6 points), and black (7 points). Whoever has the most points at the end of the frame wins that game. In professional snooker tournaments, games last from 11-15 frames.